Hunting wild boar is a keenly held tradition in the Mississippi Delta. Fraught with danger, it challenges the hunter, observer, wildlife enthusiast, and landowner alike. 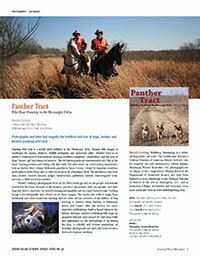 Panther Tract is an insider’s observance of extraordinary hunting, southern hospitality, camaraderie, and the love of dogs, horses, and hair-raising excitement. The 160 photographs are representative of a “day at the hunt,” starting at dawn and ending well after dark. The tales center on vivid hunting experiences, both at Panther Tract, a large wilderness paradise in Yazoo County, owned by legendary southern gentleman Howard Brent, and in other locations in the Mississippi Delta. The narratives come from men, women, doctors, lawyers, judges, businessmen, politicians, farmers, sharecroppers’ sons, and even a Hollywood screenwriter. 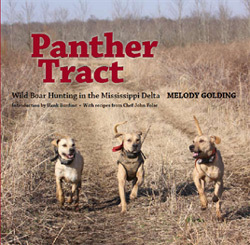 Melody Golding’s photographs focus on the Delta landscape and on the people and animals involved in the hunt. Portraits of the hunters, and their interactions with one another and their dogs and horses, fascinate. An award-winning photographer and an expert horsewoman, Golding brings a knowledgeable and critical eye to these images. The stories she collects range from traditional, often humorous hunting tales to more serious accounts of the history of hog hunting in America. Hank Burdine, a Mississippi native and hunter who has written for many statewide publications, lends a broad vision to the history, statistics, and lore of hunting wild hogs. An appendix features hunt recipes by Chef John Folse and philosophy on the stewardship of harvesting the hog. A colorful and diverse assemblage of beautiful photographs and tales, this book reveals a treasured regional tradition.